Emily Blunt and Tom Cruise live the same gruesome day over and over again. Tom Cruise sure likes his science fiction. Since first dabbling with it in Vanilla Sky (2001), he's gone on to star in Minority Report, War of the Worlds and Oblivion. 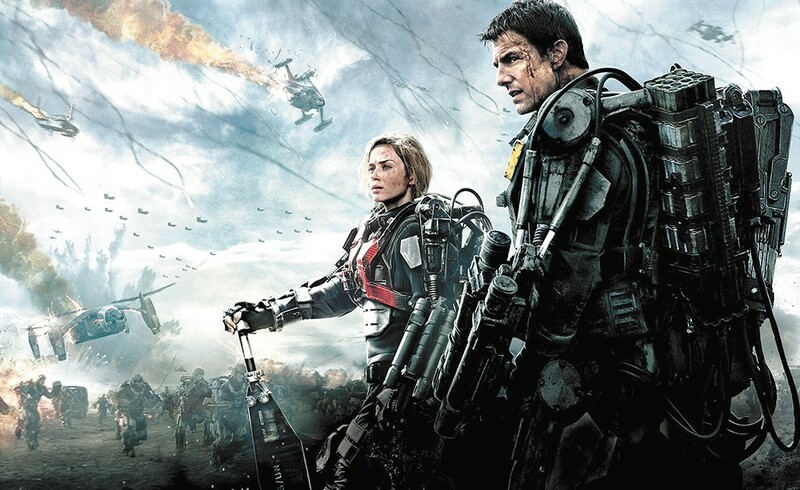 His newest, Edge of Tomorrow, adapted from All You Need Is Kill, the 2009 English-language novel by Japanese writer Hiroshi Sakurazaka, is full-fledged, spectacular science fiction. An alien race of Mimics — scary, fast-moving, multitentacled creatures — has invaded Earth, and over a five-year period, has taken over most of Europe, bloodily mowing down anyone who gets in their path. An international military has come up with the United Defense Force, an elite group of specially trained soldiers who are outfitted in exoskeleton body armor, with massive guns attached. The film also is an example of full-fledged, spectacular warfare, with fighting men and women jumping out of aircraft onto a beach in France, where they are slaughtered by enemy forces who know they're coming. Beach, France, slaughter ... that's about the only nod toward Normandy and D-Day, because things splinter off quickly into very different tangents. There are lessons to be learned here: When you're in the armed forces, don't cross your superior officers. Cruise's Major Cage has the cushy job of working in U.S. Army Media Relations, doing PR work rather than fighting. But when General Brigham (Brendan Gleeson) assigns him to head up a movie crew at the front line of a big attack they're mounting against the Mimics, and Cage balks, then downright refuses to take part in anything that could get him hurt ... well, that's when he finds himself knocked out, later realizing he's been demoted to private, labeled a coward in front of his fellow soldiers, and is on his way to the front lines, not with a camera crew, but with guns attached to his exo-suit. He doesn't even know how to turn off the safety. Here's where the film is flawed by a small glitch, one that goes away and will quickly be forgotten. Private Cage, knowing nothing about battle, having had no training, is indeed thrown into the front, where he is killed. That's right: Tom Cruise is killed in the first act. Then he wakes up, is sent back to that beach battle, is killed again, then wakes up. This goes on for a bit, and it's impossible not to make a Groundhog Day connection as Cage relives the same day over and over. Even though the time-loop business is brought up again and again as the driving force in the film's plot, this is no Groundhog Day. Whenever Cage relives the beach scene, he does it as a better soldier, having figured out how to fire and reload his weapons, with the knowledge of what's going to happen to him and those around him. He can sidestep where a alien might be attacking, or push away someone about to be crushed by a falling aircraft. One of the reasons the film works so well is that it makes up a set of rules pertaining to the plot's logic, then ignores them and makes up different rules. Another reason is the way it manages to blend its PG-13-style violence with humor, some of it courtesy of dialogue or body language, some from its approach to fast-paced, repetitive editing. Edge of Tomorrow, Edge of Tomorrow 3D and Edge of Tomorrow: An IMAX 3D Experience are not showing in any theaters in the area.